It’s been almost two years since Jacqueline (Jacquie) Czernin left her job as host of Breakaway on CBC Radio to be with her ailing mother in Kelowna, B.C., on what was supposed to be a temporary leave. But every time she was supposed to return, the date got pushed back. Finally, it reached the breaking point, and last month it was announced she wouldn’t be coming back. Today, her show aired a long-distance conversation between her and Quebec AM host Susan Campbell about Czernin’s 25-year career at CBC, including some clips of Czernin’s work (like getting Brian Mulroney to sing). The staff at Breakaway, which is based in Quebec City and can be heard on the Quebec Community Network (most CBC Radio One stations in Quebec outside Montreal), have been getting messages of support from listeners, and Czernin, who gets a bit emotional during the interview, repeatedly expresses gratitude. A permanent replacement host hasn’t been announced publicly, but Rachelle Solomon, who has been hosting Breakaway since Czernin left, would be the obvious choice. It’s not just the Quebec government that pushed through some labour deals just before Christmas. This week both CTV and Global filled their vacant Quebec City bureau chief positions. CTV’s choice is Maya Johnson, who has been at CTV Montreal for a decade now, and was working on Quebec politics while the position was vacant following Max Harrold’s move back to Montreal (he’s now an assignment editor at CTV Montreal). The choice was, frankly, obvious and you wonder what took them so long. As a result of the Bell Media cuts, Johnson’s Montreal reporter job won’t be filled. Hopefully this will give CTV’s Quebec City bureau the kind of stability it hasn’t seen since John Grant held the position. Global News, meanwhile, went with Raquel Fletcher, who was the anchor of Focus Saskatchewan at Global TV in Regina. Before that she was at CTV Regina. Fletcher was born and raised in the rectangular province, which means she’ll have a steep learning curve in Quebec City. But she won’t be the first child of Saskatchewan who’s now reporting on Quebec. Fletcher’s career path is similar to that of Global Montreal morning host Camille Ross, who worked at CTV in Yorkton and Global in Regina. Fletcher succeeds Caroline Plante, who was hired by the Montreal Gazette this summer. The National Assembly is recessed for the holidays and resumes on Feb. 9. That gives these reporters a bit of time to get settled in their new positions. Not to be outdone, there’s staffing news at CBC as well. Thomas Daigle, originally from Quispamsis, N.B., but based for several years now in Montreal, will be the new CBC News correspondent in London. Daigle, 28, worked at CJAD, Global Montreal and Radio-Canada Acadie before joining CBC Montreal. He was named the anchor for weekend newscasts when CBC Montreal added them back to its schedule, then he was moved to the National Assembly and eventually into the position of national reporter in Montreal. 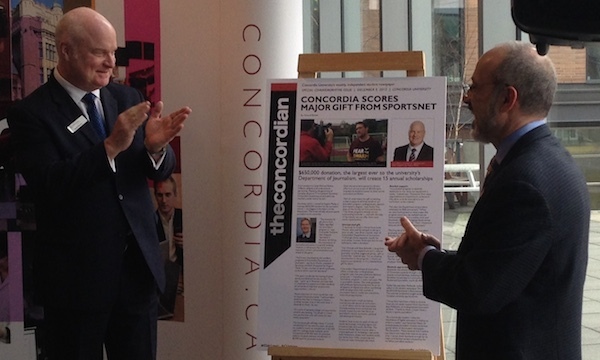 Sportsnet records its president announcing its donation at Concordia University’s journalism building on Wednesday. 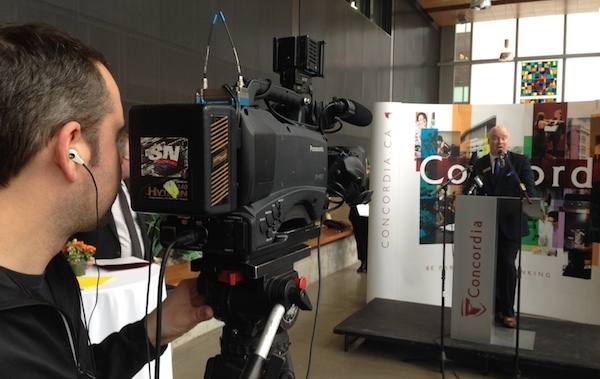 Concordia University journalism students will be getting a financial boost in the coming years thanks to a $650,000 donation from Rogers Sportsnet. This works out to $75,000 a year, or $375,000 over the five years of the program. The rest of the money will be used for things like new equipment purchases and other stuff whose details haven’t been finalized, said Concordia journalism department chair Brian Gabrial. Other than the $8,500 prizes listed above, the scholarships are not specifically sports-related. Students and staff at Concordia celebrate their donation with Sportsnet president Scott Moore (third from right). 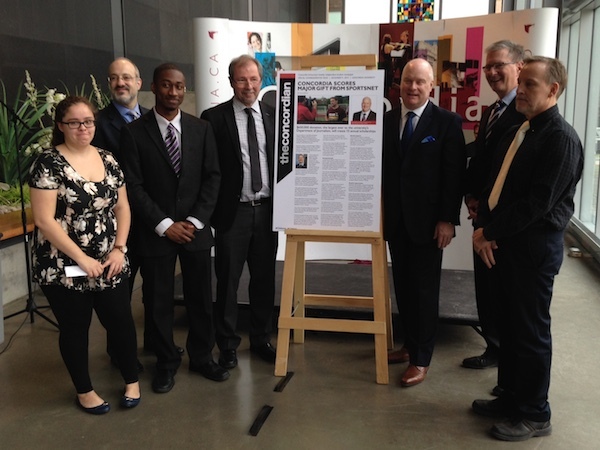 The donation, the largest in the department’s history, was celebrated with a wine-and-hors-d’oeuvres event at Concordia’s journalism and communications building on the Loyola campus on Wednesday, with Concordia president Alan Shepard Sportsnet president Scott Moore in attendance. But while this is great news for the university, it’s worth noting where this money is coming from. It’s not something Rogers is doing spontaneously out of the kindness of its heart, but rather a mandatory funding initiative linked to Rogers’s 2013 acquisition of The Score (which it turned into Sportsnet 360). 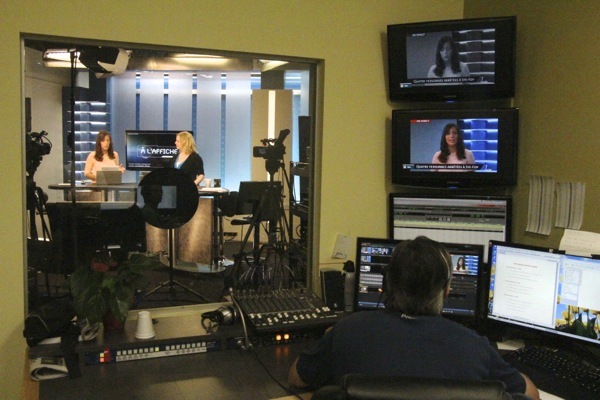 When the Canadian Radio-television and Telecommunications Commission approved the acquisition of the sports news television channel in 2013, it mandated that 10% of its purchase price (valued at $172 million) be spent on tangible benefits, or donations to programs and initiatives that benefit the broadcasting system as a whole. This is the CRTC’s way of mitigating the loss of diversity that comes from consolidation of ownership. Moore confirmed that the $650,000 donation to Concordia comes out of this tangible benefits package, which has to be paid out over five years. He said internal bureaucracy at Rogers, combined with some major distractions, caused them to get a slow start on this. Gabrial credits Bob Babinski for helping get this done. Babinski worked with Moore at CBC Sports, and after Moore moved to Rogers Media, he hired Babinski to launch City Montreal. Moore said he called up Babinski and asked about Concordia’s journalism program, and then Sportsnet approached Concordia asking them to put together a proposal. Moore referred to the donation as an “investment” in the future of journalism. That’s a nice sentiment, though the CRTC rules prevent any quid pro quo. Other Sportsnet university initiatives include the Sportsnet U Recruited program. Its first recruit is Julian McKenzie, a Concordia journalism student, former sports editor at The Link and producer at CJLO 1690 AM. After the event, McKenzie had lunch with Moore. A fake Concordian front page announcing the donation. Framed Aislin cartoons of George Balcan, left, Gord Sinclair and Ted Blackman. This morning, on its 70th anniversary, CJAD 800 inaugurated what it officially calls a “hall of fame” but program director Chris Bury admitted would probably be more accurately described as a wall of fame. Its first three inductees, unveiled during the Andrew Carter morning show, are of no surprise: George Balcan, Gord Sinclair and Ted Blackman. The three Montreal broadcasting icons, who all died between 2002 and 2004, were immortalized with caricatures produced by cartoonist Terry Mosher (Aislin), actually taken from cartoons he had already drawn of the three. “We had a few versions” for each of the three, Bury explained, and they decided to go that way rather than use old publicity photos, many of which were not in great condition, were poorly lit or seemed too serious. The framed cartoons will be hung in the CJAD studio, where people who work at the station “can get a sense of the history of the radio station,” Bury said. More CJAD personalities will join these three over the coming years. Bury said the plan is to induct one every six months or so until the 75th anniversary in 2020. “Nothing is set in stone” about who else will be inducted, though there are some obvious picks. Simple math would suggest about a dozen inductees in all, though that too hasn’t been set in stone. “I don’t know how many other stations could do this,” Bury said after the ceremony. In Quebec, the headlines from this report is that talk station FM93 is the undisputed leader in the provincial capital (Le Soleil, Journal de Québec) with a 17.7% market share, well ahead of the next best stations, Rouge FM (CITF-FM) and Radio-Canada Première (CBV-FM), tied at 12.3%. CHOI, once the market leader, is fourth at 11.1%, the same rank it was at in the spring ratings. Among adults 18-34, it has dropped from first to sixth place. It’s also sixth among women 25-54, down from a close second last year. But before you declare the CHOI style of “radio poubelle” dead, note that former CHOI personalities are doing quite well at other stations, according to data collected by Le Soleil and RadioEgo.com. Jeff Fillion at Énergie beats his former station, but is still behind FM93 (his move from the lunch hour to afternoon drive caused the lunch ratings to plummet back to a third of what they were under him among adults 25-54, and the afternoon drive numbers to more than double). Stéphan Dupont is doing well as Énergie’s morning man (whether he’s #1 or #3 depends how you measure), and it seems clear from the ratings numbers that he’s taking his audience mainly from CHOI, quadrupling his station’s audience in the mornings in one year. Éric Duhaime is #1 at noon with Nathalie Normandeau at FM93, beating CHOI’s Richard Martineau. And André Arthur’s show at CHOI is #1 in his short timeslot of 11:30 to noon weekdays. The station would probably do better overall if he was willing to take more airtime. Going up: Énergie’s well behind competitors, but its share has increased from 7.8% to 9.4%. And though CHOI is still fourth, its 11.1% share is up from 9.5% in the spring. WKND is up two points from 5.9 to 7.9% (and its reach is up about 15%). 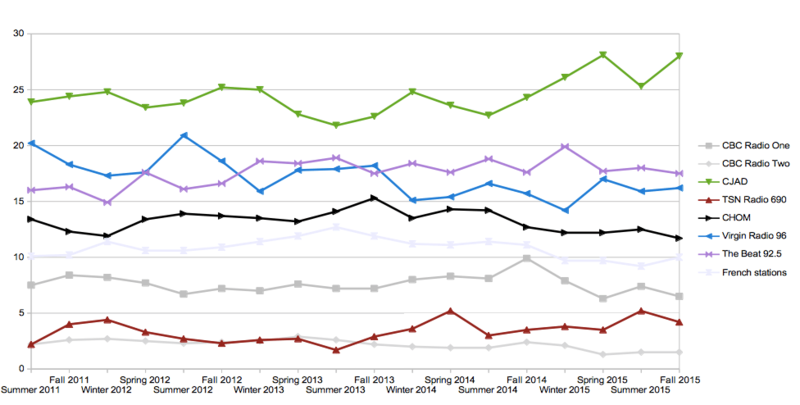 Going down: Rouge and Radio-Canada are both down about two points from the spring. CJSQ Radio-Classique saw its share drop from 4.7% to 2.5%. The fact that Radio-Classique was in transition during the ratings period probably has a lot to do with that. The sole English-language station in Quebec City, CBC Radio One (CBVE-FM), has a 0.6% rating, down from 0.7% in the spring. About 37,000 listeners in Canada listened to that station or its retransmitters on the Quebec Community Network (which covers most of Quebec except Montreal and Gatineau) for at least 15 minutes during the measured period. Little change here from the spring. The two Bell Media stations (Énergie and Rouge FM) lead with about a 20% market share each. There’s now a very tight three-way race for the top between NRJ (CIGB-FM) at 16.8%, Rythme FM (CJEB-FM) at 16.5% and Rouge FM (CHEY-FM) at 15.5%. That’s a significant drop for Rythme. Independent Bécancour station CKBN-FM jumped from 5.2% to 9.0% for fourth place, edging Radio-Canada. Talk station CKOB-FM 106.9 is behind at 6.2%, and Espace Musique jumped from 2.9% to 5.6%. Rouge FM (CFIX-FM) has solidified its dominance here and now has a 31.9% share, up from 25.3% in the spring. Its sister Énergie (CJAB-FM) dropped three points to sit at 17.5%, while KYK Radio X (CKYK-FM) gained two and a half to reach 15.7%. The Rythme FM station owned by Attraction Radio has fallen back to Earth after shooting up a couple of points following the format change. It’s now at 7.1%, about what it was before becoming a Rythme affiliate. The only two stations surveyed in this market are tight as can be: CJDM-FM (Énergie) at 27.8% and CHRD-FM (Rouge FM) at 27.7%. Competition would be intense if they weren’t both owned by Bell Media. On the anglo side, Bell Media’s New Country 94 (formerly Bob FM) still hasn’t been resonating with audiences, stuck with a 2.9% market share. But its competitor Country 101, a Rogers station operating out of Smiths Falls but which targets Ottawa, has seen its share drop more than half from 6.7% to 3.3% in a year. Otherwise, the only change by more than a couple of points is CBC Radio One, up four points to 22.9%. It has more than twice the share of any other station, thanks mainly to the fragmentation of the market. On the franco side, Rouge FM is still by far the top rated stations, but it lost 4.5% market share, and is now at 17.7%. Otherwise the only notable shift is a more than doubling of the share for Corus’s English music station Jump! 106.9, which is now at 4.2% of francophone listeners, similar to other English-language music stations in the market. I’ll leave looking at other markets to others since I’m less familiar with them. PPM quarterly ratings, which includes the Montreal English and French markets, come out next week. If you want to delve into deeper analysis, InfoPresse has posted the charts put together by Bell Media research and Cogeco Force Radio, or you can read the self-congratulatory statements from Bell or Leclerc.